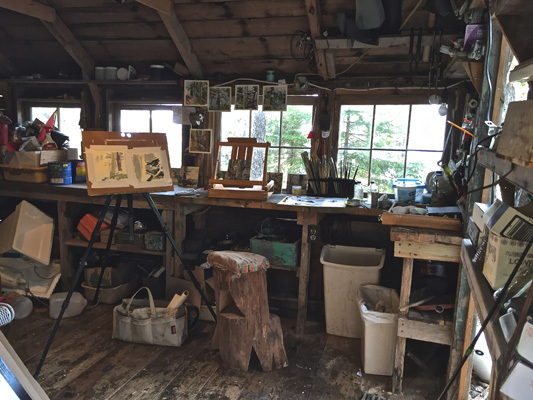 I work between two studios, one located upstairs above retail shops overlooking Frenchmen’s Bay in Bar Harbor where I have a view of the Porcupine Islands, the sea and its ever-changing light; the second an outbuilding at my home overlooking the hills of Maine. Both are chaotic. Having all my tools at hand amidst the multiple pieces of art in various stages is as much an inspiration to me as life itself. Knowing that one thing can lead to another and that I can make my art happen instantly is rewarding. Music is also an important part of my creativity, my instruments are scattered throughout both spaces and loud music is frequently played as I paint. It is important for me to be able to listen to music or pick up my instruments and play them during the day to my heart’s content. 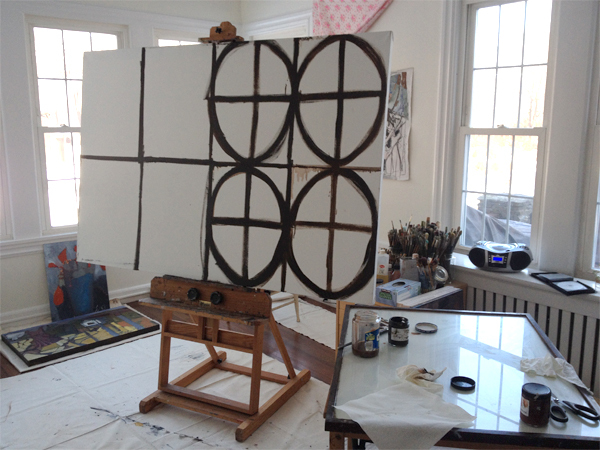 Each space has its own characteristics allowing me the freedom to create freely. My summer studio is primarily outdoors on a quiet cove in Brooksville. In poor weather and in the evening I continue work in the tool shed after shoving aside old life jackets, rusty tools, cans of paint, etc. The view from the shed windows through the trees to the water and islands is my recurring motif. I work at all sizes, completing some canvases and alternating with small studies to work from over the winter back in Vermont. 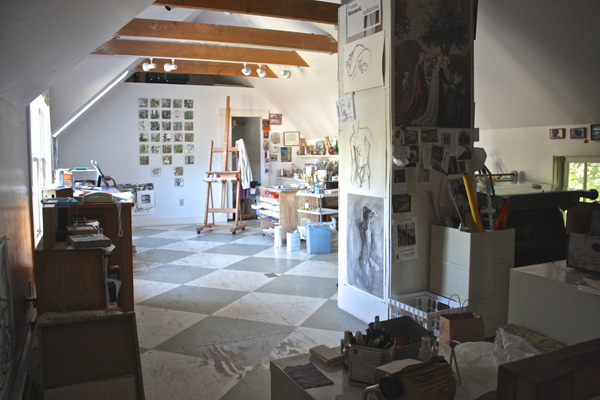 My winter studio has lots of natural light, which I prefer, no matter the season. 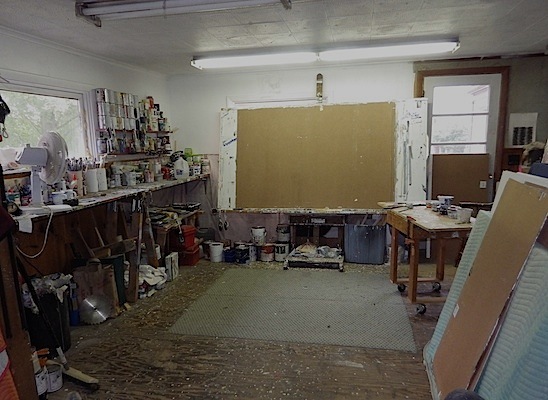 This photo was taken at the opposite end of the studio from my easel. Here I sit in my comfy chair to read and mull over my larger canvases from a distance. Studio One. Winter Studio My winter studio is located in the rectory of The Episcopal Church of St. Mary in Falmouth, Maine, surrounded on three sides by a graveyard. There is beautiful light all day with the surrounding cemetery. 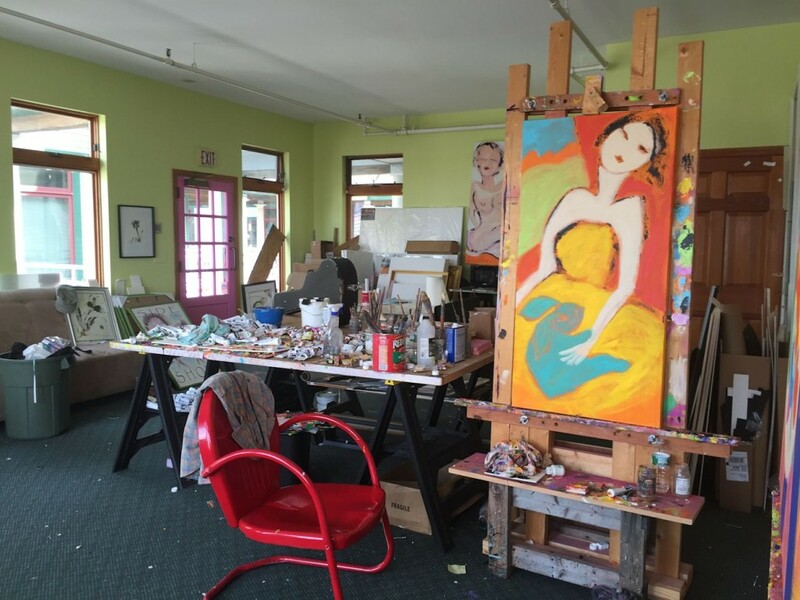 In this space I create still lifes, commissions, portraits and teach. Studio Two. When it’s not Snowing The WORLD. On location. 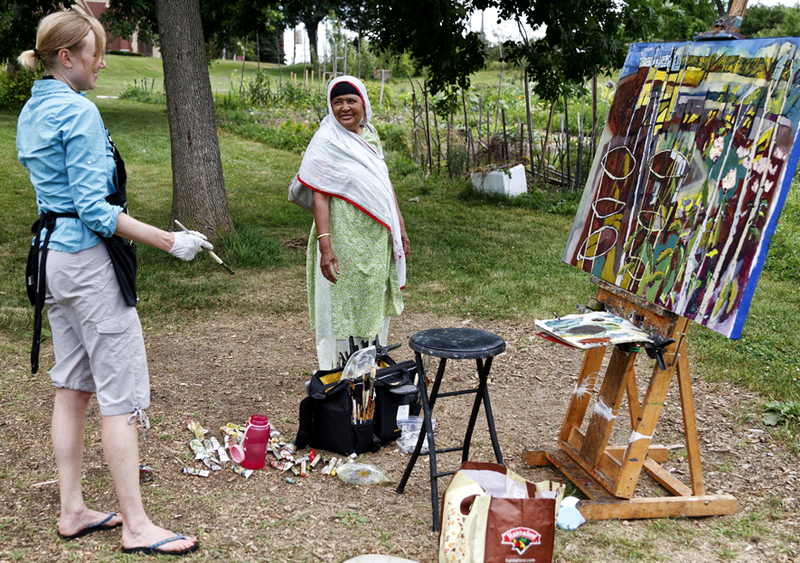 Urban Community Gardens, Bridges, Center City Philadelphia, the fire escapes of Portland, Haiti, Telluride, Kentucky…. My studio is exactly fifteen steps away from the main house in a detached building warmed in the cold months by a wood stove.